Starting pitcher Kevin McAvoy's struggles this season continued on Monday night, as the 2014 fourth-rounder allowed seven runs in six innings, striking out four and walking one. Mike McCarthy followed him with a pair of scoreless innings, though he allowed three hits and a walk. Offensively, the Sea Dogs were unable to get anything going against Reading starter Ricardo Pinto, who threw seven shutout frames. Portland's only run came in the eighth on a solo shot by catcher Jake Romanski, who was 2 for 3. The Lowell bats got off to a quick start on Monday night and never looked back, with Chris Madera and CJ Chatham scoring in the first on a single by Ryan Hanigan, who is on a rehab assignment. The Spinners scored one more in the inning and added another in the fourth, on a single by Chatham, before busting out again in the fifth. The Spinners would score five in the inning, with the biggest hit being an RBI triple by Victor Acosta, Lowell's only extra base hit of the game. Dakota Smith tossed five strong innings on the mound for the Spinners, allowing a run on eight hits while striking out five and walking none. 12th-rounder Matthew Gorst was dominant in relief, picking up his second save and allowing one run on three hits in four innings, punching out four. The GCL Sox dropped a tough one on Monday afternoon when relief pitcher Ryan Oduber allowed a walk-off home run to lead off the tenth inning. Starting pitcher Jhonathan Diaz struggled for the Red Sox, allowing four runs (three earned) in four innings. However, German Taveras got through two shutout innings, striking out four, and Oduber tossed three scoreless before allowing the blast to Orioles catcher Jean Carillo. The Red Sox bats did most of their damage in the sixth inning, with a two-run single by Alberto Schmidt and an RBI single by Lorenzo Cedrola, putting three runs on the board. Cedrola paced the Red Sox with a 3-for-5 game, that included a double, from the top of the lineup. Pitchers Bryan Mata and Rafael Gomez guided the Red Sox to a 1-0 lead in their best-of-three semifinal series against the Diamondbacks. Mata went six shutout innings to pick up the win, scattering four hits and striking out four. Gomez picked up a nine-out save, allowing three hits and striking out three . The Red Sox jumped a 2-0 advantage in the top of the first. After Everlouis Lozada walked and Yeison Coca doubled, Juan Hernadez had an RBI groundout and Pedro Castellanos ripped an RBI single. In the seventh inning, the top of the order manufactured the team’s third run as well. Lozada reached base four times (single, three walks) from the top spot in the order, stole a base, and scored twice. Game 2 of the series is Tuesday afternoon. 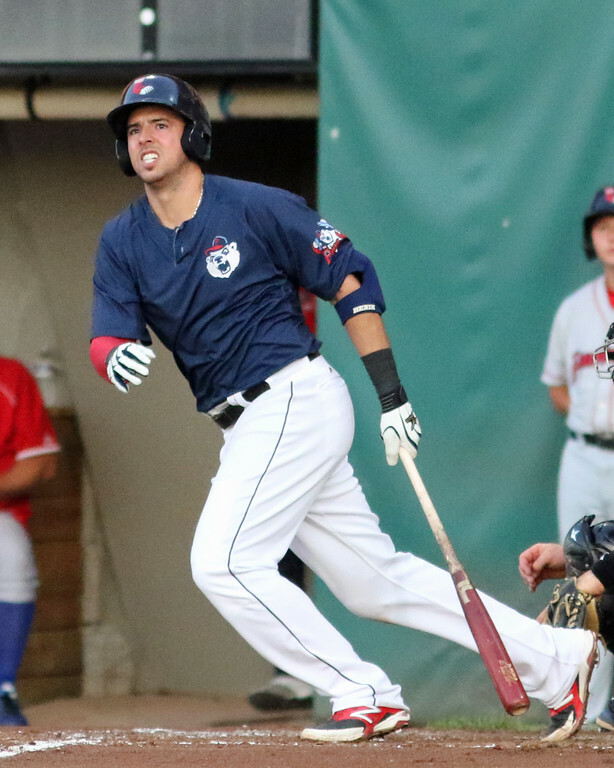 Player of the Night: Chris Marrero has enjoyed a productive season in Pawtucket, with the most recent chapter coming in a victory on Monday night. The designated hitter was 2 for 4, driving in four runs, and scoring one, as part of an excellent game. In 124 games this season, Marrero has slashed an impressive .287/.344/.501 with 27 doubles and 23 home runs. The Red Sox acquired Marrero via a minor league contract in August 2015.